This post was sponsored by Shoes Of Prey, as always my opinions are my own. Thank you for supporting the brands that support The Classic Brunette! Oh I am so excited to be sharing this post with y'all today! I've been an admirer of Shoes of Prey for a long while now, so when they reached out for collaboration I said yes in a heartbeat! If you've never heard of Shoes of Prey, let me give you the quick rundown: they offer a wide variety of styles in all kinds of sizes and widths (US size 2-15 in regular, narrow, wide, and extra wide so everyone is included!) but the best part is that you can custom make your own perfect pair of shoes. HECK YES, right?! Was it anyone else's dream to get to make your own shoes and be the designer behind what your wear? Shoes of Prey lets you actually take control of all the details that go into your pair of shoes from the style, the colors, the material, everything! I was lucky enough to make two pairs of shoes, and I'm obsessed obsessed obsessed with both of them! I knew I wanted my first pair of shoes to be fun, but also wearable so I went with a shorter heel with a bit of sass to it. As you are well aware, blush pink is one of my favorite colors, so it was an easy choice on the color! 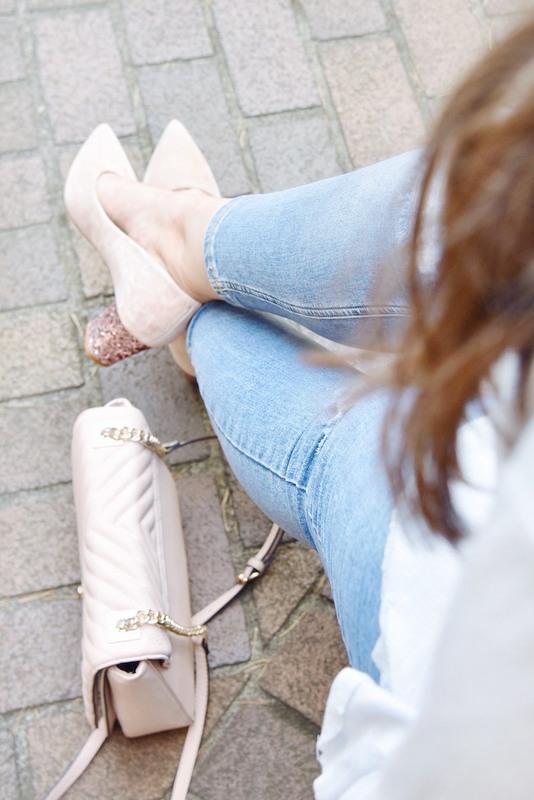 I chose to go with a blush suede throughout the shoe, but added a pink glitter heel to really make them stand out. I debated for a long time while creating these if I wanted to go all out with a full glitter heel, but figured that this would be more of a unique and subtle look. I'm just so extremely happy with how these turned out, the glitter is so vibrant and fun, but doesn't take over the whole shoe. I could easily pair them with a business casual outfit or a party dress and they would work for both! Another thing that really sold me on Shoes of Prey is the comfort of their shoes, and how they even go the extra mile by sending you two different kinds of insoles to ensure that comfort! When wearing these out I kept repeating myself saying "Wow these are so comfy" and "I could walk all day in these!" and believe me it's true! I've honestly never met a more cushioned and walkable heel in my life, and that goes for both this pair and the higher heels I created below. I didn't even need the extra insoles they sent me! And just one more fun thing about this pair of shoes, they literally have my name on them! Although I didn't take a photo, these heels have my name inscribed on the inside, the best finishing touch on a custom shoe if you ask me! If you choose to purchase your own custom pair, use the code SAMIMAST for a free inscription ($49 value!) so we can be custom shoe buddies! Last but definitely not least, I have my second pair of shoes created with Shoes of Prey. For these I wanted a more vintage and classic look, something that my trendy closet is always lacking. I think these are actually my favorite of the two. They just look so stunning, and I can't believe that I was the one who made them look this pretty, ha! I decided on black and white to fit into the classic category again and also added a T-strap to pull the look together, aren't they just dreamy? Just like the pink heels, these are also amazingly comfortable. I'm not sure how I survived in other heels before coming across this website because the level of comfort is off the charts! That's saying something since these particular heels are about 3 inches tall. 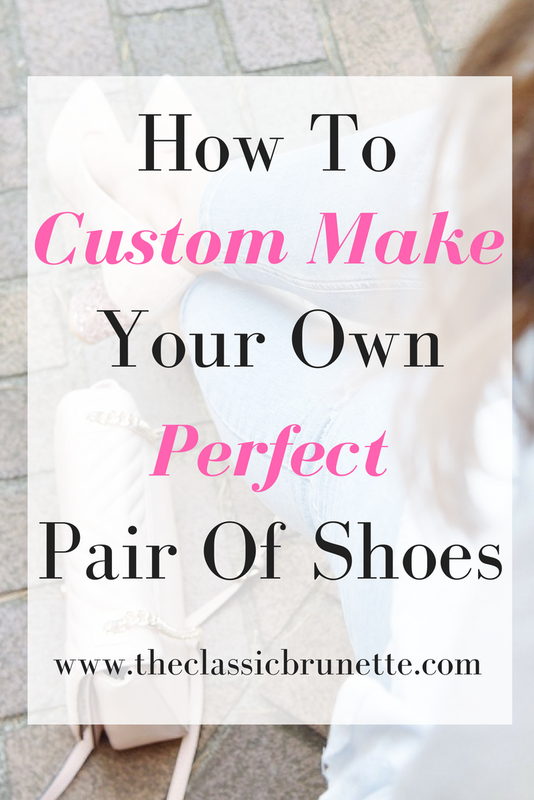 Intrigued enough to custom make your own pair of shoes yet? Shoes of Prey doesn't only make heels, they make sneakers, slides, pumps, almost any style of shoe is at your designer whim! If you're not into the customization thing, but are still loving the shoes I made, don't worry you can shop those too. Here are the pink glitter heels, and here are the vintage black and white pumps! But if you do create your own pair, I would love to see what you come up with! Tag me on Instagram with your custom shoes so that I can see your design! Don't forget to use SAMIMAST for a free inscription either way. Oh wow Sami these are so cute!! I can't believe I haven't heard of this shoe company. This is so awesome and these shoes are too cute!! love the sparkle! Those shoes are fabulous! Never heard of Shoes of Prey but def checking them out! I like the heel height on the sparkly shoes. Not too tall not flats. I always have issues finding heels I'm comfy in. Omg designing your own shoe!? Sounds like a dream! And they're sooo cute! i need all of these in my life - so cute! Love these tips AND the pretty shoes! This is awesome! I struggle to find shoes that fit me in regular stores because my feet are narrow- I could really use a service like this. I LOVE Shoes of Prey! it's always awesome to be able to create custom shoes just for you! Those heels are so fun! I love that you were able to customize them to your liking!